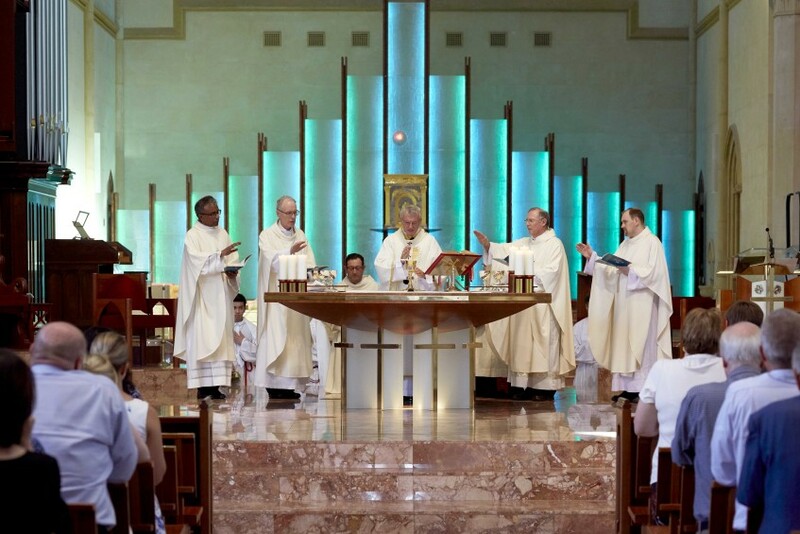 Fr Sean Fernandez, Bishop Donald Sproxton, Archbishop Timothy Costelloe SDB, Vicar General Fr Peter Whitely, and Fr CJ Millen consecrate the Blessed Sacrament on 1 February. Photo: Ron Tan. “We have an obligation to them to consider and then do what is best for them, rather than to make our own comfort or our own wishes our first consideration,” he stated. 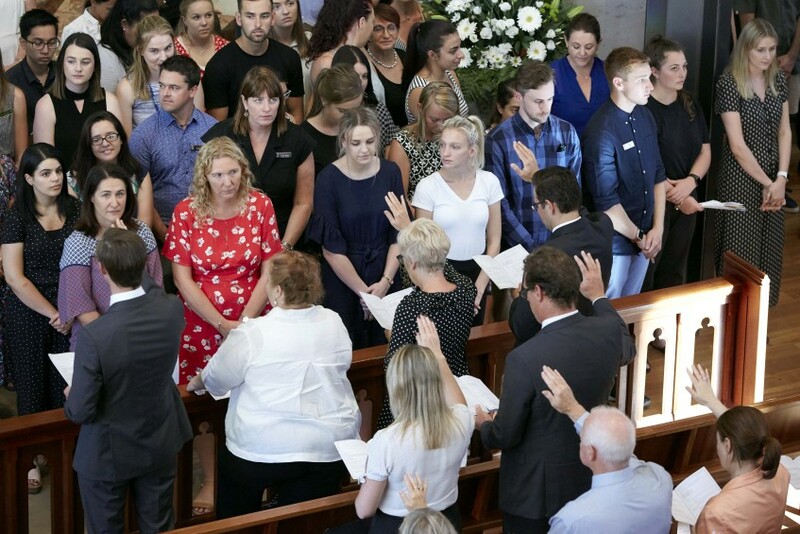 It was the first commissioning Mass to be held before the start of the school year, in previous years they took place after the first term had begun. 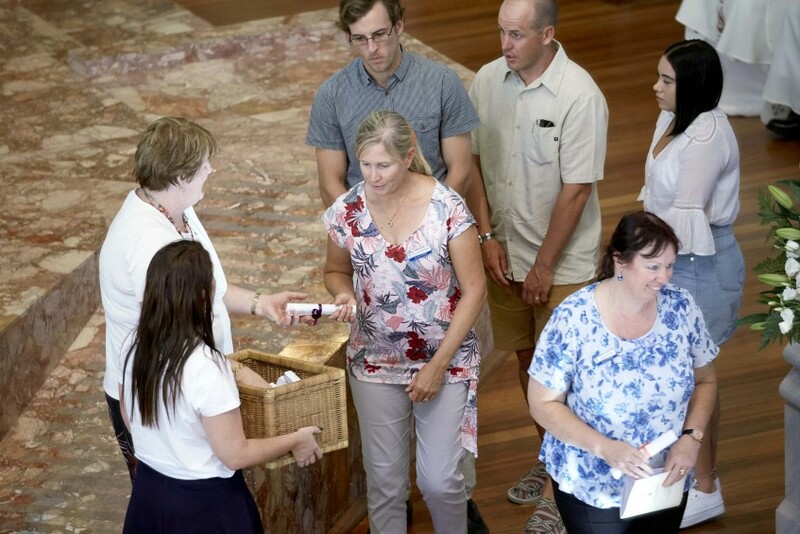 A total of 225 new and transferring school staff were welcomed to Catholic Education Western Australia (CEWA) on 1 February as they collect their scrolls blessed by the Archbishop of Perth. Photo: Ron Tan. CEWA Executive Director Dr Debra Sayce opened proceedings at St Mary’s Cathedral with a few words before Archbishop Costelloe commenced the Eucharistic celebration, joined by concelebrants Auxiliary Bishop Donald Sproxton, the Very Rev Fr Peter Whitely VG, Cathedral Dean Fr Sean Fernandez, and Cathedral Assistant Priest Fr CJ Millen, assisted by Deacon Mark Powell. “Thank you for your continual support of our 73,000 students across the whole of Western Australia,” Dr Sayce expressed. Archbishop Costelloe began his homily reminiscing on his childhood as an altar server at his home parish in Melbourne, where the positive influence of a friendly Assistant Priest indirectly guided the now-Archbishop of Perth to join the priesthood. Having great mentors to aspire to, he said, is imperative to shaping the lives of students. 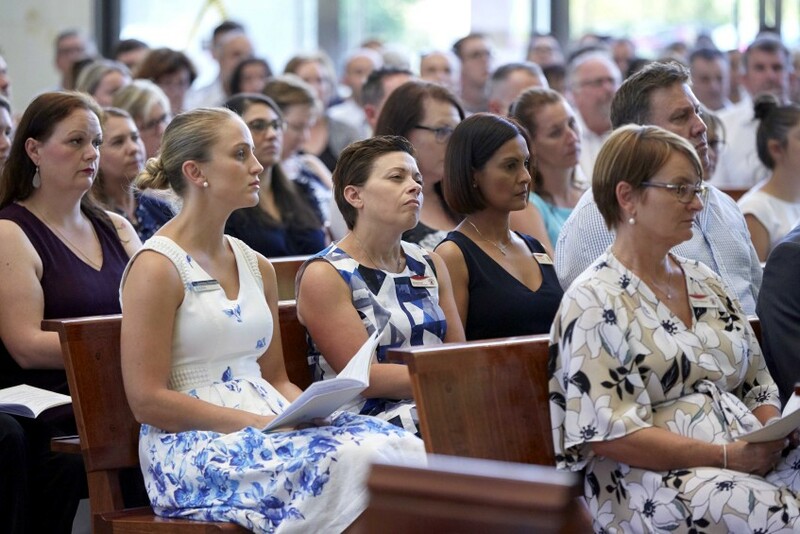 “The chance that you, as people who work in Catholic schools, will have a significant and even determining influence on the future of the young people with whom and for whom you work is very real,” Archbishop Costelloe said. CEWA staff greet one another with “the sign of peace” at St Mary’s Cathedral on Friday 1 February. Photo: Ron Tan. Teachers, he added, are entrusted with a daunting responsibility – albeit an enormous privilege – when influencing one’s educational path from pre-primary to the end of secondary. “Not only with their intellectual formation, but with their physical wellbeing and development, their social and emotional growth and, in our Catholic schools, their spiritual and religious formation as well. Archbishop Costelloe reiterated the significance of remaining in-line with Catholic identity. “The high ideals of Christianity, as they are taught and lived in our Catholic tradition, certainly demand a great deal from us. “The recognition of our mutual responsibility for each other, which is such a characteristic of our Catholic world view, does not really leave much room for those who want to put themselves rather than the young people first,” he continued. CEWA staff listen to Archbishop Costelloe’s words of wisdom at St Mary’s Cathedral on Friday 1 February. Photo: Ron Tan. By truly committing to our young people and taking Jesus at his word, he added, a Catholic community will grow in understanding of the faith, which is the essential foundation of every Catholic school. Bateman parishioner Sarah Hicks has recently commenced her role as Year 3 teacher at St Jerome’s Primary School in Munster. “As my first year working in education, I feel a great responsibility and pride to be able to work with the saints of the future. I’m excited by the challenges that Catholic education poses,” she told The eRecord. 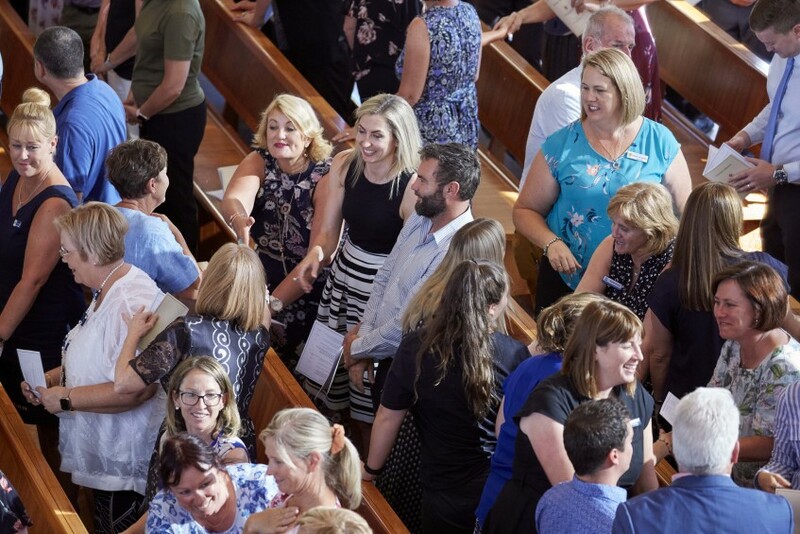 Catholic school principals from across Western Australia welcome their new staff at the 2019 commissioning Mass at St Mary’s Cathedral. Photo: Ron Tan. Ms Hicks reflected on Archbishop Costelloe’s notion that working in Catholic education is a “calling” from God. “This resonated with me as I found my vocation to teaching after working in the corporate industry for a while,” she added.